Trucking firm Lindsay Australia would not have shifted its operations from Coffs Harbour to Queensland if national heavy vehicle regulations had been in place, a New South Wales MP claims. The Nationals’ Andrew Fraser has blamed onerous NSW regulations ranging from loading to the cost of registration for Lindsay’s decision to leave behind the town where it established itself in 1953 for a more business-friendly climate north of the border in 2003. Fraser, who holds the seat of Coffs Harbour, made the claim during a debate on a bill to adopt a national framework for governing heavy vehicles. The new regime is due to begin on September 1 to deliver a consistent set of rules throughout the country, except in Western Australia. "Lindsay Brothers, now known as Lindsay Australia, moved from Coffs Harbour to Queensland because of the regulations applying to its business in NSW under the former government," Fraser says. "If this legislation had been enacted at the time Lindsay Brothers would not have relocated to Queensland but rather would have stayed in Coffs Harbour where the business originated." While Lindsay’s still maintains a link to Coffs through a depot in the region, Fraser says his electorate suffered financially when the business uprooted itself to run its head office out of Brisbane. Fraser says the company spent $600,000 relocating, but it made the money back in short time. "Sometime after the move [co-founder] Tom Lindsay told me that he had recouped that $600,000 within three months of moving, which provides an indication of the cost burden on transport businesses in NSW," Fraser says. Murray-Darling MP John Williams echoed Fraser’s sentiments on heavy vehicle regulations in NSW, saying they have restricted trade and encouraged businesses to base themselves interstate. "NSW is the most over-regulated state in relation to the heavy transport industry," he says. "People who had the opportunity to establish their businesses in this State or in Victoria decided to go across the border because the transport regulations there are more favourable. That is totally unacceptable." 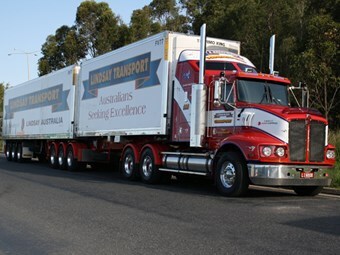 The NSW Government has in recent years moved to ease the regulatory burden on trucking companies operating in the State. Roads Minister Duncan Gay has removed the number of truck notices drivers need to carry, introduced a livestock loading scheme, increased access for road trains, opened up more of the road network to higher mass limits and abolished stamp duty on purchases of new trailers. Both houses of NSW Parliament have now passed the Heavy Vehicle (Adoption of National Law) Bill. "I implore all state governments to continue to negotiate to ensure that all the reforms adopted by NSW are adopted nationally as that will enable the transport industry to go about its business delivering freight from country areas into our cities," Fraser says. "Almost all the food that is put on our plates in city areas comes from regional electorates. Freight from those regional electorates must be delivered economically to ensure that our city cousins are well fed now and in the future."